How to Learn Juggling in 15 Minutes! Please read thru the entire text before beginning to juggle.
. How to Learn Juggling in 15 Minutes! : Please read thru the entire text before beginning to juggle. [Internet]. Version 25. personalonlinejournal. 2014 May 27. Available from: https://personalonlinejournal.wordpress.com/article/how-to-learn-juggling-in-15-minutes/. To learn to juggle correctly, both of your hands must have the same level of coordination, such that your left hand can throw a ball up into the air at the same speed that your right hand does, and so that a ball thrown up into the air by your left hand follows the same curved path through the air (to your right hand) that a ball thrown up by your right hand follows as it’s headed over to your left hand—and all of this throwing occurring with each hand remaining within an imaginary, one-foot diameter “sphere” that surrounds each hand—as you are catching and throwing the juggled items. And, believe it or not, learning how to juggle is easier than trying to follow that last sentence! 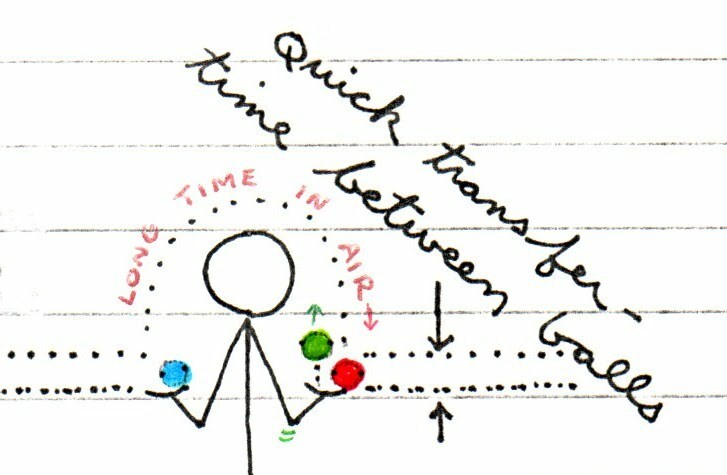 Practice throwing a ball from hand-to-hand until you can achieve the same speed and path through the air from either direction, while keeping your hands within the imaginary, one-foot diameter “sphere” that surrounds each hand. And let the ball fall down to your hand…never reach up beyond the imaginary “sphere” to catch it. Can you see how the trajectory of the ball in the “SIDE” diagram above is on a flat plane? Imagine that there is a plate-glass window right in front of you, and that you do not want the ball to make contact. Hold two balls in your right hand and one ball in your left and practice throwing just one ball from your right hand (BALL 1, the red one in the “AT REST” depiction below…the ball that sits on your fingertips), over to your left hand—as we discussed in Step One—and then simply catch BALL 1 with your left hand’s fingertips and thumb. Now, throw that same BALL 1 back to your right hand, and vice versa, until you become proficient at catching BALL 1 in either hand. And remember to keep your shoulders relaxed, and to keep your knees slightly bent to give yourself a flexible stance. This back-and-forth exercise with one ball will get you familiar with catching a ball in a hand that already has a ball in it! Being able to catch a ball in a hand that already has a ball in it is the secret to successful juggling! Start Step Two…but, just before the ball from your right hand (BALL 1) reaches your left hand, toss up the ball that’s in your left hand (BALL 2, in the diagram below), and then catch the falling BALL 1 with your left hand. BALL 2 is now headed over to your right hand, hopefully. Just catch BALL 2 with your right hand, and then stop! Throw the balls up on the inside of the balls coming down, as you see in the third diagram from the left above. Later, when you are better at juggling, you will be able to throw the balls up on the outside of the balls coming down, for a dramatic effect! Instead of just catching BALL 2 in your right hand, and then stopping, as you did in Step Three, first toss up BALL 3 (again, throwing it up on the inside of the BALL 2 that’s coming down), and then catch BALL 2 in your right hand; and then catch the BALL 3 (that you just threw up leftwards with your right hand) in your left hand. Stop. Repeat this step, from the beginning, several times. Believe it or not, you are now only one step away from being able to juggle! Continue onward from Step Four by throwing up BALL 1 before catching BALL 3 in your left hand. Now, with BALL 1 headed back to your right hand, you can simply catch BALL 1 in your right hand, and stop! If you would like to at this point, you can continue tossing the balls back and forth to opposite hands, until you decide to stop at either hand. Either way, what you have just done is learn how to juggle…and in only a few, short minutes! A word of caution: After you juggle for about 6 or 7 seconds, some who are watching you may become bored…so stop while you’re ahead, until you’ve learned more than just the basics, as you are learning here! To throw a ball up into the air, you should first lower your hand to the bottom of that imaginary “sphere” that we have been discussing, and then “push” the ball upwards, releasing the ball at the top of the “sphere.” This self-imposed governor on movement will constrain you from launching a ball into the stratosphere—particularly with your less-coordinated hand! There should not be any quick, halting movements of your hands at any time during the juggling process—only smooth, flowing movements. Raise your hand to the top of the imaginary “sphere” and “break the fall” of the ball as it comes down, stopping your hand as it reaches the bottom of the “sphere.” Now you are ready to “push” that ball back up again. Have someone video-tape your juggling, and you will notice on the tape that as any one ball travels through the air from hand-to-hand, the other two balls are being held in each of your hands for a majority of the said traveling ball’s flight. you will only have to be concerned with going and catching that ball, since you are already holding the other two! and all of the balls end up on the floor. This “wrong move” scenario should not happen to you very often, now that you know how to correct a throwing error!